All of this Gran Turismo Sport downplaying was tiring before Christmas, but it’s even more wearisome these days. Folks still have to be interested in the game to buy it, you know? Both God of War and Detroit: Become Human are still going for full price, and they continue to sell very well too. Nintendo served an ace with Mario Tennis, and should continue to do well in the coming weeks when Wimbledon begins this time next Monday. FWIW, Aces had a double Gold Points for pre-order on the eShop and is currently 3rd behind Hollow Knight and Minecraft on the all games chart. I for one purchased it digitally for that reason. I really do hope that Nintendo continues this trend, because I was so close to buying it digitally however, I had a physical copy on pre-order for £38.95 (at The Game Collection), which is £11 cheaper than buying it on the eShop. I see that the ‘Days of Play’ campaign has been very kind for Sony this year! Besides the French’s obvious love of Nintendo, Europe really is ‘PlayStation Land’. Probably been mentioned already in this thread, but I assume the bump in Switch console sales must be because of Fortnite, Mario Tennis and Minecraft? Pretty sure alot of kids that play Fortnite on Phone will be asking for a Ps4 or Switch this Summer to play Fortnite. Are Forza games not getting bundles anymore? That Fortnite PS4 bundle is going to move some serious units. Oh I forgot about Fortnite.. that might be pushing HW a lot more than Tennis. Did we ever get an idea of how many copies Mario Tennis Aces sold? It’s probably safe to assume it’s above 10k since FIFA has gotten a bigger boost due to the World Cup right? Days of Play had a great impact. God of Legs and Detroit Become Legs doing well. Edit: Nevermind I got confused, I believe it's the week before last week as we get delayed charts from other European countries. Germany? Nope. Spain? Yes more or less. Mario Kart games have been in the top 5 selling games on pretty much every Nintendo platforms. It wasn’t the case for Zelda. Breath of the Wild is not only the best selling Zelda game ever ; but it will be the first Zelda game to sell over 10 million copies on a single platform. Actually, when it’s all set and done, I think Zela will sell at least 15 million copies on Switch. Mario Kart 8 Deluxe sales are incredible to ; but by Mario Kart standards, not that much. Mario Kart Wii and Mario Kart DS won’t be challenged. I guess it could sell more than Mario Kart 7, maybe. This doesn't look like dominance to me, and with digital the difference would be even higher. Nintendo performs better in France than the other countries, but let's not overstate it. The same about Germany and Spain, you can't really believe they perform the same. Horizon Zero Dawn in the Top 5 in Europe after one year and 4 months: unbelievable. The whole top 10 is very strong for playstation . Oh wow unit sales no longer matter. That would make sense if different games didn't have multiple monetization models. There's a reason publishers are more than willing to slash prices to increase MAU. They can make more money on the back end and they get a bigger cut if you buy digital. If you want to talk revenue you need to then include microtransactions and dlc. Also much easier to maintain prices when you have a virtual monopoly in sales on retail software on your platform. What is this chart? Digital rankings for all Europe? Nope, which is why Forza Horizon 3 dropped (out of the charts) like a rock! The main Xbox One S bundles these days are Sea of Thieves and PUBG, and it is mostly the reason why we see those two games somewhere in the top forty on a weekly basis, seeing as bundled copies are added towards the overall units in the PAL charts. I wouldn’t be surprised if Forza Horizon 4 stays in the charts for a long, long time due to it inevitably being the main bundle until Gears 5 and Halo Infinity arrives. This looks like a very good week for Switch.. really wanna see this Media Create numbers for Switch. Yep. Very happy for that. Horizon was my goty for a long time. Hope for Horizon 2 be a ps5 launch tittle. Digital + Retail for most Europe, by January 2019 the whole Continent will be covered with Digital + Retail. Is it me or did GI.biz publish the wrong ranking? That's ostensibly only the PS4 one, not the total one they write about in the text. Yeah that chart is PS4 only. Donkey Kong is in the top 10 but isn't listed there. Why? It's Europe and Sony had Days Play. "While the GSD does track digital sales, Bethesda, Konami and Nintendo still refrain from publishing their digital data. With that caveat in mind, below are combined digital and retail sales for Europe provided by the GSD, and processed by outsource service provider B2Boost." 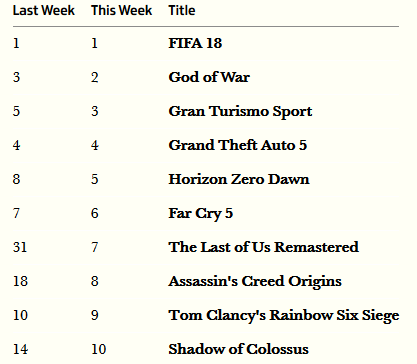 Compare the text with the ranking: it says Horizon zero dawn is 9th/10th but in the ranking it's 5th. Also, several Nintendo games are mentioned to be in the top 10, but they're not in the ranking shown. text is only about retail. Table contains combined data – digital + retail sales. Table is Retail & Digital Combined. Yeah I stopped even discussing it with these guys, they clearly have it out for GTS. Literally hundreds of games get discounted to what GTS is at but they never crack the top 10. Being at No 3 for Europe without being bundled is impressive this far out regardless of pricing. I see, looks like I read over that. Not really. If you want to evaluate consumer spending on new titles in the market revenue is more helpful than units since units can fluctuate wildly with sales and promotion. Different data has different strengths and weaknesses when evaluating different metrics. I still like seeing units over revenue but the way the UK charts are now we get both which is ideal. Shocked to see Aces beat a WC driven FIFA. Given that other Switch games haven't quite reached the top spot, I'm sure Nintendo will be happy with that. It was confusing. The writer could have been clearer. PS4 will end up as the best selling console ever in Europe or very very close. Ah yeah makes sense. Also bodes well for Sony because I believe their digital percentages are generally still higher than Nintendo's. That's great information -- combined retail and digital from all of Europe. How come we don't get this data regularly? This is the first I've heard of it. So on the one hand, Mario Tennis Aces has already sold more than Ultra Smash for WIi U. On the other hand the game had a fairly low opening on par with previously released Wii U ports. So TLoU still charting in the top 10 after 5 years. Can you give us the GoW drop? That's interesting to know. The Wii U game was awful though so I'd imagine its numbers were atrocious. Sales in Europe are huge for Sony and when we will have all number it will be much easier to understand sales number for exclusives give by Sony. Yup. I was honestly shocked by how badly Ultra Smash did. Like there is Wii U bad. Then there is Ultra Smash bad. Don't know about that but it will be their most profitable PlayStation ever due to digital growth to this extent.